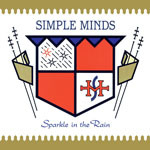 Share the post "Album review: SIMPLE MINDS – Sparkle In The Rain (box set)"
If New Gold Dream (81-82-83-84) marked the beginning of Simple Minds departure from their new waves roots, Sparkle In The Rain – their 6th album, released in 1984 and produced by Steve Lillywhite – completed the transition. It was the first of a trilogy of number 1 albums, and now – 30 years down the line – it gets the ‘deluxe’ treatment. Buyers get a choice of the standard 2 CD deluxe offering – the album re-mastered at Abbey Road Studios by Andrew Walters and overseen by Charlie Burchill – and with disc two brigading the single edits, B-sides, and 12″ remixes from the 3 singles lifted from the album – Waterfront, Speed Your Love To Me, and Up On The Catwalk. And for those with ‘cash to splash’ there’s a box set containing 3 more discs. – a contemporary live set from Glasgow Barrowlands recorded the February 1984 – the month the album was released, a three track BBC Radio 1 session from September 1983, and a DVD with Steven Wilson 5.1 and high res stereo mixes and the promo videos for the three singles. A 36 page booklet adds to the temptation. Popular opinion is that Sparkle was an album of 2 halves – the first side, featuring the anthemic stadium fillers and the second, well, just fillers. It predates my interest in the band which started with the bombastic globe straddling follow-up Once Upon A Time, but visiting the album now for the first time it seems to me that, while the pace does admittedly falter in the second half of the set, the material has dated pretty well. “C” Moon Cry Like A Baby, in particular, is something of a hidden gem. Deluxe editions are always a tricky proposition. Here, I’m not sure the second disc – single edits and remixes – merits indulgence especially when you can get a single CD version for only a fiver – one third of the price – on pre-order at Amazon. 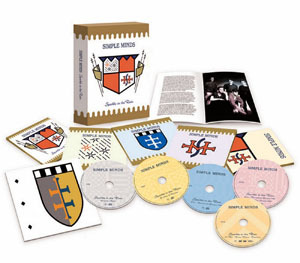 Similarly, the box set comes at whopping premium of £40. The main attraction there, if you’re not a 5.1 aficionado, is the concert material but it’s fairly raw and not the greatest live recording you’re ever going to hear. More of historic interest than essential listening. This entry was posted in ALBUM REVIEWS, ALBUM REVIEWS (Mobile), All Posts, Reissues and tagged 5.1, album, BBC, box set, DVD, live, pop, radio, reissue, review, rock, session, Simple Minds, Sparkle In the Rain. Bookmark the permalink.